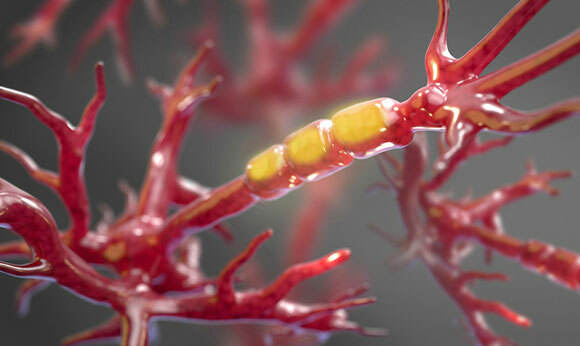 A team of scientists from Harvard Medical School has identified a key instigator of nerve cell damage in people with amyotrophic lateral sclerosis, a progressive and incurable neurodegenerative disorder. Researchers say the findings of their study, published in the journal Science, may lead to new therapies to halt the progression of the uniformly fatal disease that affects more than 30,000 Americans. One such treatment is already under development for testing in humans after the current study showed it stopped nerve cell damage in mice with ALS. The onset of ALS, also known as Lou Gehrig’s disease, is marked by the gradual degradation and eventual death of neuronal axons, the slender projections on nerve cells that transmit signals from one cell to the next. The HMS study reveals that the aberrant behavior of an enzyme called RIPK1 damages neuronal axons by disrupting the production of myelin, the soft gel-like substance enveloping axons to insulate them from injury. “Our study not only elucidates the mechanism of axonal injury and death but also identifies a possible protective strategy to counter it by inhibiting the activity of RIPK1,” said the study’s senior investigator Junying Yuan, the Elizabeth D. Hay Professor of Cell Biology at HMS. The new findings come on the heels of a series of pivotal discoveries made by Yuan and colleagues over the last decade revealing RIPK1 as a key regulator of inflammation and cell death. But up until now, scientists were unaware of its role in axonal demise and ALS. Experiments conducted in mice and in human ALS cells reveal that when RIPK1 is out of control, it can spark axonal damage by setting off a chemical chain reaction that culminates in stripping the protective myelin off of axons and triggering axonal degeneration—the hallmark of ALS. RIPK1, the researchers found, inflicts damage by directly attacking the body’s myelin production plants—nerve cells known as oligodendrocytes, which secrete the soft substance, rich in fat and protein that wraps around axons to support their function and shield them from damage. Building on previous work from Yuan’s lab showing that the activity of RIPK1 could be blocked by a chemical called necrostatin-1, the research team tested how ALS cells in lab dishes would respond to the same treatment. Indeed, necrostatin-1 tamed the activity of RIPK1 in cells of mice genetically altered to develop ALS. In a final set of experiments, the researchers used necrostatin-1 to treat mice with axonal damage and hind leg weakness, a telltale sign of axonal demise similar to the muscle weakness that occurs in the early stages of ALS in humans. Necrostatin-1 not only restored the myelin sheath and stopped axonal damage but also prevented limb weakness in animals treated with it. At the outset of their experiments, investigators homed in on a gene called optineurin (OPTN). Past research had revealed the presence of OPTN defects in people with both inherited and sporadic forms of ALS, but scientists were not sure whether and how OPTN was involved in the development of the disease. To find out, researchers created mice genetically altered to lack OPTN. Examining spinal cord cells under a microscope, the scientists noticed that the axons of mice missing the OPTN gene were swollen, inflamed and far fewer in number, compared with spinal cord cells obtained from mice with the OPTN gene. These axons also bore signs of myelin degradation. Strikingly, the researchers noticed the same signs of axonal demise in spinal cord cells obtained from human patients with ALS. Mice with OPTN deficiency also exhibited loss of strength in their hind legs. Further experiments revealed that lack of OPTN was particularly harmful to myelin-secreting cells. Thus, the researchers concluded, OPTN deficiency was directly incapacitating the nervous system’s myelin factories. But one question remained: How did the absence of OPTN damage these cells? Looking for the presence of chemicals commonly seen during inflammation and cell death, the researchers noticed abnormally high levels of RIPK1—a known promoter of cell death—in spinal cord cells from mice lacking OPTN. Moreover, the scientists observed traces of other damaging chemicals often recruited by RIPK1 to kill cells. That observation, Yuan added, was the smoking gun linking RIPK1’s misbehavior to OPTN deficiency. In other words, researchers said, when functioning properly, the OPTN gene appears to regulate the behavior of RIPK1 by ensuring its levels are kept in check, that it is broken down fast and that it is cleared out of cells in a timely fashion. In the absence of such oversight, however, RIPK1 appears to get out of control and cause mischief. In a closing set of experiments, the researchers examined neurons obtained from mice with the most common inherited form of ALS, one caused by mutations in a gene called SOD1. Indeed, RIPK1 levels were elevated in those cells too. Thus, the investigators said, OPTN may not be the sole gene regulating RIPK1’s behavior. Instead, RIPK1 appears to fuel axonal damage across various forms of inherited and acquired forms of ALS. The findings suggest that RIPK1 may be involved in a range of other neurodegenerative diseases marked by axonal damage, including multiple sclerosis, certain forms of spinal muscular atrophy and even Alzheimer’s disease. The Harvard Office of Technology Development (OTD) and collaborating institutions have developed a patent portfolio for RIPK1 modulating compounds. Harvard OTD has licensed the patent to a biotechnology company. The work was supported in part by grants from the National Institute of Neurological Disorders and Stroke (1R01NS082257) and the National Institute on Aging (1R01AG047231), by the National Science and Technology Major Project of China (2014ZX09102001-002) and the State Key Program of the National Natural Science Foundation of China (31530041). Be the first to comment on "Harvard Researchers Identify a Key Instigator in Lou Gehrig’s Disease"